Public Talk # 1: Techno Fantasischism - Jump into the unknown. Public Talk # 1: Techno Fantasischism - Jump into the unknown. from Prediction TV on Vimeo. Thanks for attending Public talk #2! Sneak peak of next week's public talk 'Afrofuturism and the vocoder, a mythical non­existence', by Danny van der Kleij. A piece made during the time of the reagan economic regime culminates the vocoder and ideas of the future into a funky track. Stay tuned! Is it luck? Or is it skill? What is the secret to success in the stock markets? Is it possible to make money in stocks without trawling through dozens of research reports and listening to the advice of ‘financial experts’? Indeed, in many cases, you’ll probably lose money even after following the advice available all over the place. So, is it possible that winning the market sweepstakes is more about chance than picking the right stock? Firstpost decided to test that theory with a well-known technique — the “Monkey Portfolio”. The Monkey Portfolio is a portfolio created on a purely random basis. No deliberate calculations or analyses have been done to include or exclude any stock. In other words, any monkey could have picked the stocks! However, it’s not 100 percent chance we are talking about. Like investing in index stocks, we have limited our random picks to stocks in two indices of the Bombay Stock Exchange — the BSE 100 and the BSE 500. Assuming that the indices are composed only of well-traded and relevant stocks, the randomness of the choices our Monkey makes relate only to stocks within these two indices. We have created two portfolios of 10 randomly chosen stocks each and will track their performance against the two top indices, the Sensex and the Nifty, in the coming weeks and months. We will also be shortly creating an expert portfolio comprising stocks recommended by professional stock pickers. We hope they will outperform our Monkey — or Monkeys, since we have two such portfolios. 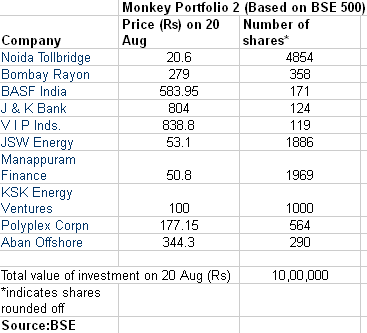 The 10 stocks that we chose from the BSE 100 ( Monkey Portfolio 1 ) and BSE 500 See Monkey Portfolio 2 are essentially random Monkey Picks, though we must admit that a fair bit of effort did go into the ‘random’ bit. Basically, we generated a random sequence of 10 numbers, ranging between 1 and 100, and then picked our stocks using that sequence for the first portfolio. Here are two examples of how we did this: if the sequence contained the number 41, we chose the 41st stock on the BSE 100 list. If it contained 99, we chose the 99th stock on the list. 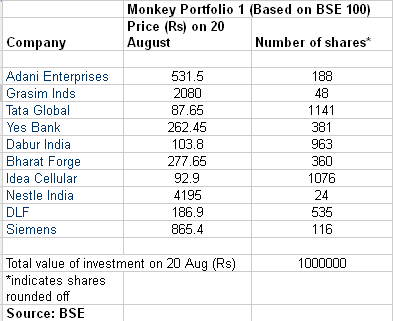 In this way, our random string of numbers gave us the 10 stocks that made up our first Monkey portfolio based on the BSE 100. The top 100 list itself was randomly generated by our database, and not subjected to any filtering or criteria. So any stock could appear in any position. We did the same with the BSE 500. The next step was the investment. We decided to invest a notional amount of Rs 1,00,000 (Rs 1 lakh) in each of these stocks, based on their closing prices on Friday. Column 2 in the accompanying tables show how many shares of each company were bought using that notional amount. The notional amount invested in the entire portfolio thus totalled Rs 10,00,000. (In order to get a round Rs 100,000 invested in each share, we have retained the fractional shares for our calculations, even though our table shows only discrete share numbers). Will our two monkeys do better than the indices? Or the experts? Watch this space every week on Saturdays. Public talk # 1 was a success! For those who missed it, the video will be uploaded soon. Click here for more info on public talks. The next talk will be on the 6th of December by Danny van der Kleij on the utopian imagination of Afrofuturism. A conversion between Darija Medic and Amy Suo Wu on connecting points throughout their thesis's, titled Navigating in the age of magical reproduction and Reclaiming uncertainty with para-rational methods, respectively. Through historical and contemporary examples, the fantastical nature of the future and technology alike will be reflected on as spaces of possibilities that allow people to inject desires, fears and paranoias. The construction of reality is addressed through the performativity of code, the mechanism of self-fulling prophecy and the politics of knowledge legitimization. Further, meandering thoughts on technology and prediction as continuing practices of magic, as a means to control the natural world, will underpin the conversion.